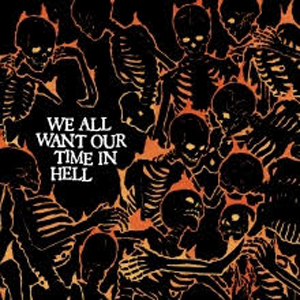 If you like your ear candy heavy and dark you will love We All Want Our Time In Hell Vinyl Only tribute to 80's Goth Punk Icons SAMHAIN. This thirteen band tribute includes new recordings by JOEL GRIND, MIDNIGHT, NIL EYE, RINGWORM, GHOUL, ACID WITCH, MULTICULT, LIKE RATS, SHED THE SKIN, IMMORTAL BIRD, CHILD BITE, BRAIN TENTACLES and RITUAL HOWLS. I have always been a huge Glenn Danzig fan from his heavy rock of the 90's to his Comic Books by Verotik. Heavy Gothic opener "Night Chill" (Joel Grind) is an instrumental piece that is reminiscent of "Sisters of Mercy". I love a moody track that makes me feel like dancing like this one. "Mother Of Mercy's" (MIDNIGHT) Punk Rock anthem will keep moshing alive. Released just in time for Mother's Day. "In My Grip" (NIL EYE) is a total Mosh Pit song. It grabs you by the seat of your pants and doesn't let go. Ultra cool hip shaker friendly "Macabre" (GHOUL) has dark guitar, vocals and alternative drums which hold down the cool vibe on this song. The killer vocal on "Halloween II" (ACID WITCH) will appeal to your inner creep! More Punk Rock on "Unbridled" (CHILD BITE). "Human Pony Girl" (BRAIN TENTACLES) has a Gothic feel that highlights the vocals describing what Glenn Danzig will do to his "Pony Girl". One minute and fifty eight seconds worth of pure adrenaline can be found on RINGWORM's cover of "Black Dream". The Gothic Punk Rock sentiment on this tribute album is right on point with SAMHAIN's style.